You may have noticed rocks featuring motivational messages around the grounds of our St. Catharines hospital. Make it a Great Day, This Too Shall Pass, You Are Enough and You Rock are some of the messages on the rocks. Sarah Kerrigan and Shelby MacDonald, recreation therapists in our Mental Health Program, recently learned of the Kindness Rocks Project, an international campaign to spread inspiration and motivation for unsuspecting recipients through random inspirational rocks dropped along the way. Sarah and Shelby loved the idea and decided to bring the Kindness Rocks Project to Niagara Health. 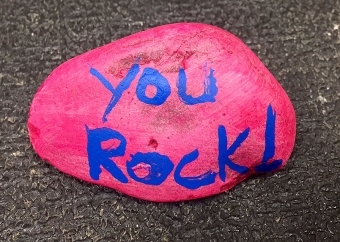 Rocks with motivational messages are being painted by Mental Health staff and patients. The patients are leaving the rocks around the hospital grounds to share an uplifting message and spread kindness to others. The movement has inspired other recreation therapists in the Mental Health Program, including outpatient groups, to have their patients join the project and decorate rocks. Sarah says patients have enjoyed sharing inspirational message with others. The project is part of Niagara Health's 1,000 Acts of Kindness Workplace Challenge. If you find a rock or choose to make your own rock, please share it with us. Send us your photo to our Twitter account @NiagaraHealth using the hashtag #NHKindnessRocks. Learn more about the Kindness Rocks Project here.